Schedules, budgets, communications, changes. Projects big and small include them all, and Microsoft Project 2013 can help you control the variables--rather than be controlled by them. But Project is a complex program, and who has the time to take on the project of learning it? 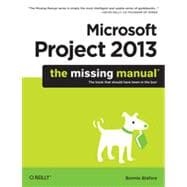 Get up to speed fast with Microsoft Project 2013: The Missing Manual." Written by project management expert Bonnie Biafore, the book teaches you how to do everything from setting, tracking, and adjusting schedules and budgets to testing scenarios and understanding the impact of changes. No project manager should be without this book.